Training wheels don’t teach balance; they just make learning to balance that first bike a little safer. Those little devices simply prevent a mistake from turning into an accident. 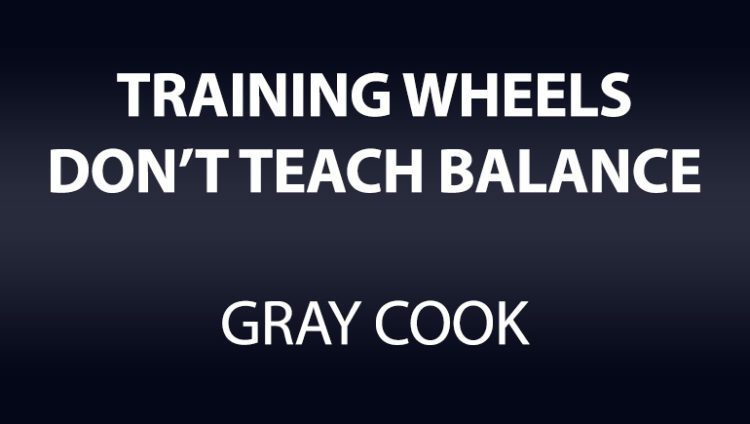 Training wheels are the tools, not the training, and in fact, they can actually hinder perception and slow the process of learning balance if used incorrectly. Have you ever seen a child lean on one training wheel while making a turn? If you’ve witnessed this, you have watched the child learn a behavior that will actually need to be unlearned. This was not learning to appreciate balance; it was learning to ignore it. If we put the training wheels on a child’s first bike and took the time to demonstrate how the wheels work and challenged the child with a goal, learning would be accelerated. Saying “Honey, these little wheels are there to catch you, but try to never lean on them” would provide cleaner learning and would not set up a situation in which the child would need to unlearn something later. A great little perception and education tool would be to put some tape around the perimeter of each training wheel and have your little learner attempt to ride short distances without marking up the tape. You could let the child also just have fun and ride and play, but every now and then, do the tape test. When you’re not looking, the child would probably practice a little as kids always do. The subtle message you are sending is, here is the safety net…now try not to use it! The beginning of corrective exercise is no different. This is particularly important when cre­ating a stability experience that could potentially become an exercise. Too much help or advice will not force the sensory motor system to perceive a problem and start searching for a behavior to recapture control. Flight simulators are designed to allow a student pilot to make mistakes without risking life and limb. The simulators still indicate and report mis­takes, and that is where the learning comes from. Safe perception and correction of many movement mistakes will improve movement learning speed. Once the training wheels come off, you can’t verbalize how to ride a bike, can you? You can explain how it feels, but you can’t say how you do it. Riding a bike is a perceptual and behavioral experience that does not lend itself to complete or compressive verbal description. The ability to perform a stable half-kneeling posture or a solid single-leg stance is no different. Those who can do it cannot explain it as quickly as strug­gling can produce it in those who can’t, provided it’s a correctly dosed experience. The point here is that correctives need to be challenging and mildly stressful, but they always need to be safe. Modern conveniences are partially to blame for many of our movement problems. Adaptive move­ment behaviors are minimized every time a new group of modern conveniences is introduced. The loss of adaptability represents specialization, and overspecialization is the kiss of death for biologi­cal organisms. Modern conveniences are nice and we should keep them, but what happens when we start adapting exercise equipment to make those more convenient, too? If exercise were a movement-quality stressor, movement patterns might be maintained. However, modern exercise equipment is usually designed to allow quantity regardless of the level of quality. This is the fundamental reason some self-limiting activities should be performed as part of a general exercise program. Physical exercise is the last chance we have to maintain physical adaptability, and when we lose that adaptability, corrective exercises must fix it. Once corrected, better exercise choices should maintain it. Corrective exercise and general exer­cise must produce manageable stress in areas of both quality and quantity, and if it doesn’t, it’s not likely to produce appreciable authentic movement. Advanced corrective strategies are drills used to incorporate and coordinate the attributes of mobility and stability into movement patterns. It’s common for a person to have the mobility and stability required, but for some reason be unable to perform a movement pattern. This individual has the physical and mechanical ability, but just can’t produce the behavior. We need to help connect the dots and turn ability into behavior. Sometimes the person is thinking too much, obsessing too much, or concentrating on the wrong thing. Of course, the opposite can be true as well—the client or patient might be detached, under-sensitive, and out of sync with a posture or movement. That person is over-processing some­thing natural, authentic and fundamental, or is not connected to it at all. Advanced corrective exercises break these cycles four different ways. No single way is best; each one provides an option that you can employ to incorporate movement fundamentals into movement patterns. Each of these techniques can be called advanced, but these are really just move­ment pattern retraining. Different problems and personalities will respond differently to each technique. Do not disregard the basic correctives in the previous chapter. They create the foundation and might produce all the correction needed to change a screen or assessment. The advanced corrective strategies that follow are designed to work with fundamental mobility and stability already in place. Each drill or technique has a trick it plays on the perceptional and behavioral systems, but the trick can only be effective if the criterion is in place prior to the activity.